One of the problems with Athens is that there are almost too many historic and archaeological sites — the city is full of fascinating landmarks, and many of them are in guarded areas that are closed during the best hours of sunrise and sunsets. February 2017, single image, additional exposures for highlights, focal length 20mm, aperture f/11, shutter speed 15 seconds, ISO 64, tripod. For ordinary tourists, this is no issue, since they simply want to explore the site. For photographers, who may want the backdrop provided by early morning or late afternoon sunlight, it’s a problem. I had this problem with the Tower of the Winds. The site — which is one of the best-preserved in Athens — is closed at the times I would most like to shoot, and like many other archaeological sites, tripods are not allowed. But the site was too beautiful and too intriguing to be discouraged by these setbacks. There is little that we know with certainty about the Tower of the Winds. It was built in the 1-st century BC by the Syrian astronomer Andronicus, and was meant to serve as a kind of timepiece. 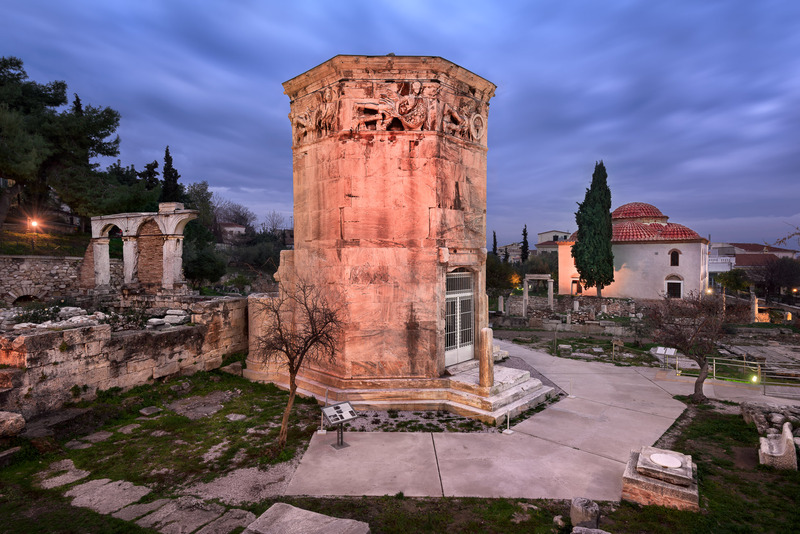 Designed in an octagonal shape, each side of the tower faces a point of the compass and each side is topped with a frieze depicting the Anemoi, or the eight winds of Greek mythology. Sundials were placed beneath each frieze and inside the tower was a unique device known as a clepsydra, or water clock, which was powered by a stream of water flowing down from the Acropolis. Though it is lost now, the tower was originally topped with a weather vane, which may have also been used to predict the future as well as tell the direction of the wind. Over the centuries, the tower had other purposes. Early Christians used it as a bell tower for a cathedral and later, when the area was under Ottoman rule, the tower was used by dervishes as a place of contemplation. Nowadays, the restored tower is a tourist attraction, but it is the structure’s original purpose that intrigues me. In this city that gave so much to the world — from philosophy to democracy — I stand awestruck in front of what is essentially a two thousand-year-old weather station. I was determined to capture the significance of the site, using long exposure to emphasize the moving clouds behind the tower. It seemed appropriate to me to do this, given the tower’s importance to the Greeks as a timepiece and predictor of the future. This entry was posted in City and tagged Athens, Greece.